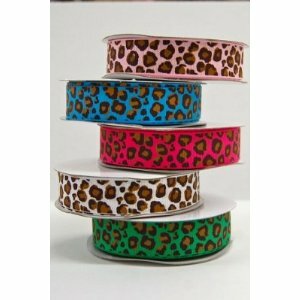 7/8″ by 10 yds (30 ft) 100% Polyester Grosgrain ribbon in colorful animal print. A FANTASTIC deal for your sewing & decorating needs!!!! our special price $8.00 roll ONLY 80 cents a yard…COMPARE TO $ 1.69 YARD AT THE FABRIC STORES!!!! Make Beautiful Decorations at a fraction of the cost of pre-made bows. Top quality 100% polyester grosgrain ribbon. This ribbon is great for clothing, hair bows, sewing, craft items, party decorations and gift wrapping. CHEETAH is one of the **Hottest** new patterns! This ribbon will make beautiful bows to decorate your craft projects. Make party favors & wedding decorations. Make beautiful HAIR BOWS!!!!!!!!! Available in Pink, White, Green, Fuchsia and Blue animal print. Great for hair bows, sewing, crafting, etc. High quality – for wedding favors and decorating. Amazing addition for gift wrapping, party favors, etc.